In retrospect I should have worked more aggressively inside the system as we discussed during the Providence Statement and had options and I should have used these options. Unfortunately, I can't go back and change things. I can only go forward. I want to go forward. Before I can do that though, I understand that I must pay a price for my decisions and actions. Once I pay that price, I hope to one day live in the manner I haven't been able to in the past. I want to be a better person-- to go to college-- to get a degree-- and to have a meaningful relationship with my sister's family and my family. I want to be a positive influence in their lives, just as my aunt Deborah has been to me. I have flaws and issues that I have to deal with, but I know that I can and will be a better person. I hope you can give me the opportunity to prove-- not through words, but through conduct-- that I am a good person, and that I can return to a productive place in society. The first and most important thing that needs to be said about this statement is, as Wikileaks responded, it “shows that as far as his sentencing is concerned there are still decades to play for. 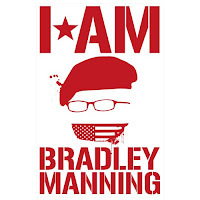 Public pressure on Bradley Manning’s military court must intensify in these final days before the sentencing decision against him is made.” We all must continue to support Bradley Manning, and continue to campaign for his unconditional release. After three years of detention, including prolonged solitary confinement, being repeatedly stripped naked and subjected to cruel and degrading treatment, after having his guilty plea to charges making him liable to 20 years of imprisonment deemed insufficient, after being denied a chance to make a whistleblower or a no-harm defense, after having his deepest personal traumas paraded against him, and facing 90 more years of prison time, Bradley Manning can make any plea he thinks might save him decades of imprisonment, and continue to exact our unflinching support. Whatever plea Bradley Manning makes to the tribunal that will determine his fate for the next 90 years, the job of his supporters remains to campaign for his immediate, unconditional release. Now, however, there is a conundrum. 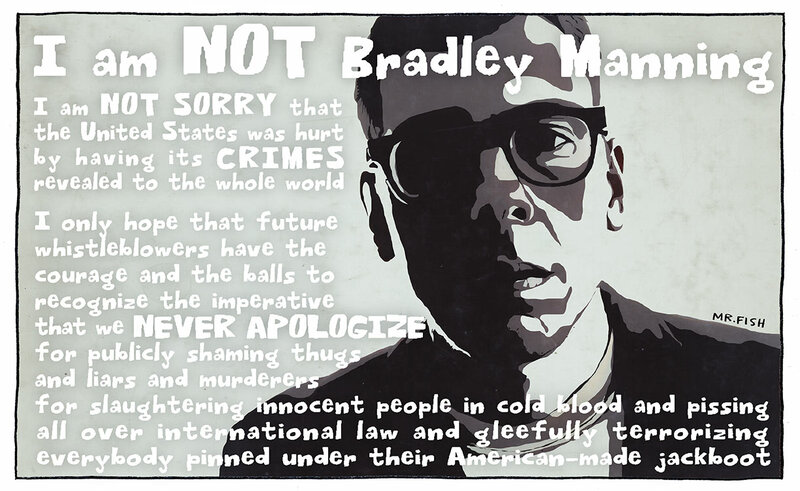 That is because, to put it bluntly, Bradley Manning does not determine the meaning of Bradley Manning. As discomfiting as it may be, and as difficult as it may make our task, we have to acknowledge that, politically speaking, this statement of Manning’s is terrible. It may be personally necessary for him, in ways that no one not facing a century of prison time can fathom. As must everyone, his first task is to navigate the predicaments of his life. We now know more about his intense isolation and alienation, resulting from his very difficult lifelong personal predicaments, of a kind for which our aggressively individualistic society offers little support. That is now intensified exponentially by the seemingly inescapable legal predicament, facing eternal confinement, he is now in, thanks to the one person he dared turn to for support. (There is no hell hot enough for Adrian Lamo.) In such a context, there’s no judging or begrudging his personal decision. Politically, however, it is undeniable that this statement works against the movement his own actions helped to create – including the movement for his defense. The first thing in his discourse is apology. Followed by “I am sorry” four times. Followed by “I hurt the United States” and “hurt people” because “I was dealing with a lot of issues” and “I did not truly appreciate the broader effects of my actions” and didn’t have enough respect for “the decisions of those with the proper authority.” It is a discourse dripping with guilt and remorse for his actions, that explains those actions in terms of personal confusion and immaturity, and that culminates by denigrating himself – self-judging himself through the very actions of his that we value most, and see as proof of what a fine person he already is – as someone who needs “the opportunity to prove” to this punishing tribunal that he can “be a better person.” This is a sad stance, in which Manning implicitly disavows his strong actions, and his own strength in taking them, throwing himself at the mercy of the pitiless machine whose crimes he himself exposed. This statement also implicitly undermines the rationale of the movement – the movement Manning did more than anyone else to engender – that defends American whistleblowers as those who act on political and moral principle, in ways that are carefully considered, and that help and strengthen our citizenry and our country. Between those positions, which this movement has forcefully articulated, and this statement of Manning’s, there is no congruence; there is contradiction. To deny this is to be – well, not credible. Indeed, to be credible, and to stay the course of support for Manning as the political agent he has been, we have to accept that we are doing so whether he recognizes himself to be that agent or not. This statement provides ammunition that will be used against Edward Snowden and Julian Assange, and any others – it may in fact deter some – who dare follow the brave example of them and Manning himself. Unfortunately, it’s clear that, in order effectively to defend his actions and theirs, we cannot depend on, and indeed have to distance ourselves from, Manning’s discourse of self-understanding. To put it another way, Bradley Manning is not Bradley Manning. Personally, he’s not the Bradley Manning we have been talking about politically. One might say, using a true cliché, that he’s not the Bradley Manning that he was. Who would be, after all that he’s been through? In this statement, he’s certainly not the Bradley Manning that we want him to be. 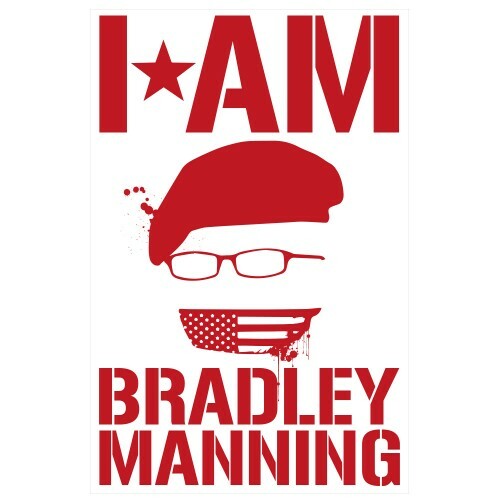 He’s not, in other words, the Bradley Manning that we have been producing in our political discourse – and that we must continue, with all due attention to his utterances, but grounded in our own understanding of his all-important actions, to produce. Bradley Manning’s actions, for which he deserves all credit, are no longer “his.” They have a life of their own, and will speak in ways whose significance will be determined in a contested conversation, which his voice, though important, does not control. We confront here the political version of what in literary theory is the question of the author’s authority (echoed in legal theory as the question of “original intent”): Is the author of a novel, poem, play, or any cultural text the source and final arbiter of its meaning? It the author the text’s definitive reader? Or is the meaning of a text determined in social-differentiated and historically-evolving networks of readers (including critics), cultural (academic, media, and political) institutions, and associated framing discourses that work over the text to "clarify" and "elucidate" -- actually to produce -- its meaning and value in ways that escape any authorial intention? In the latter position, which I hold, the author’s expressed or imputed reading of a text, is -- although an important one to which attention should be paid – but one voice in this process of the production of meaning and value. Take, for example, Samuel Beckett, one of the twentieth-century’s most highly-regarded playwrights, and his Waiting for Godot, one of the twentieth-century’s most prized plays. Beckett famously derided a well-worn path of interpretation of his play by saying: “If by Godot I had meant God I would have said God, and not Godot.” And, sure, one should take that sentiment into account and proceed with care if one is convinced of the religious, or anti-religious, undertones of the play, but even Beckett himself can’t really close that path off. And do we, his readers, bow to his wishes, when he exclaims, horrified at the prospect: “I AM AGAINST WOMEN PLAYING GODOT”? (Yes, his all-caps.) Do we accept the authority of his estate when it sues – successfully in France in 1992, and unsuccessfully in Italy in 2006 – to prevent the staging of a female Godot? I think, rather, that these gestures make it even clearer that the author, or even his lawyer, does not get to determine the meaning of his work. Sorry, Sam, but your work, your text, has a life of its own, that you no longer control. An example of a politicized struggle over the author’s tenuous authority took place in 1984, when Reagan’s presidential campaign, with some cooperation from the national media, tried to appropriate Bruce Springsteen as a Reaganite kind of guy, and his music and career as "meaning" the American dream: how hard work, ambition, and the unfettered ability to accumulate wealth can give hope to working-class Americans. Springsteen answered back. He began reminding his concert audiences that the words of his songs (like "My Hometown") hardly proclaim the durability of that erstwhile American dream. He also publicly donated concert proceeds to union welfare funds, and spoke to workers rallying against plant closures, telling them: "What goes unmeasured is the price that unemployment inflicts on people's families, on their marriages, on the single mothers out there trying to raise their kids on their own.” Although the media did not pay as much attention to these authorial interventions, they did mute the Reaganite chorus, and led to a kind of stand-off. In this case, then, the intervention of a living author had a real (and positive) effect – because he engaged in the ongoing, contested discourse that was producing its meaning. With Bradley Manning, we are in the position of having to assume the authority to assert a meaning for his actions that now contradicts his own “authorial” interpretation (à la Beckett), while paying sympathetic and wary attention to the influence of his living authorial voice (as in the Springsteen example) and the unfortunate memes supplied by its last utterance, which our political and media apparatuses are going to repeat and amplify in the worst possible ways. This is going to be difficult, and there’s no use pretending otherwise. It’s not as easy, not as straightforward, to call for the unconditional release of a prisoner who has ratified his need for punishment and rehabilitation. It’s not as easy to insist that his actions have been constructive and enriching of our national life when he says they hurt people. It’s not as easy to insist on his political and moral clarity when he attributes his actions to “issues” and insufficient respect for “proper authority.” It may get harder, depending on how Bradley Manning, under intense, unfathomable pressure, “proves” to his tribunal and himself that he’s “a good person, and … can return to a productive place in society.” He could become the Norma McCorvey of whistleblowers, or the Edward Snowden of whistleblowers. We can’t know. Bradley Manning is confused, and is confusing us. That’s our tough luck. Per the song: That’s what our world is today. Right now, without illusion, and without trying to deny the obvious, we have to recommit to our conviction that Bradley Manning is a person whose exemplary concern for his country and humanity led him to perform an important service for us all, that he does not deserve to spend another millisecond in prison, and that his actions are and will be celebrated and honored by all who honor justice and truth. And we must reserve and preserve our anger, our fury, for those who have done, and are doing, their utmost to crush the spirit of a good and decent man, those who are taking a man who, in his confusion and courage, has changed the world for the better, and are punishing him, and persuading him that he deserves to be punished, for doing so. 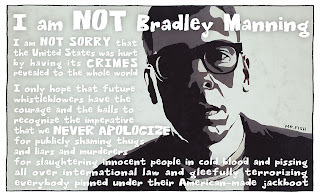 Bradley Manning revealed a lot of crimes, but this crime -- well, now is the time for our tears, and anger.